The Holy Name of Mary Church was originally designed to be the chapel of the adjacent Villa MariaMonastery. The foundation stone was blessed by the Archbishop of Sydney and laid on 15 September 1867. The church was a long time in the building, but eventually was formally blessed and opened by the Marist missionary Bishop Louis Elloy on 12 February 1871. The church is unique in Australia in its design and decoration. When it was first built, it was a common practice to use building plans borrowed from elsewhere. The Marists brought in plans from their place of origin, the rural areas around Lyon, France. The stained glass and statuary are also from Lyon. The earliest windows came from Lyon and were manufactured by Pagnon Deschelette in 1868. These are the large windows in the transepts and possibly the smaller windows each side of the altar. The six windows intended for the sides of the church were lost when the clipper ship ‘Walter Hood’ sank near present day Sussex Inlet in 1870. The replacements came from Pagnon Deschelette in 1872. In a letter dated 4 October 1872, Superior Fr Joly, the Superior at Villa Maria and the builder of the Church, , mentions “The windows have come, but (are) not yet unpacked.” It seems likely that the two patterned windows at the rear of the church also came from Pagnon Deschelette, as their construction and colours are like the others from that firm. Two windows, the one showing Our Lady of Lourdes in the Lady Chapel and of St Patrick, now at the rear of the church, came about 1886, from G Dufètre of Lyon. The one of St Patrick may have been moved from opposite the Lourdes window in a connecting passage to the Chapter Hall. Finally, the other and ‘atypical’ window near at the left rear, of The Queen of Heaven, probably dates from 1904 and the extension of the church to its present length. It commemorates Hannah McBride, who died in 1902. The statues are not dated, but those inside the Church were manufactured by a Monsieur Gousset of Lyon. Those of Mary above the altar and of the Sacred Heart and St Joseph at each side are referred to in 1871 in a letter from Fr Joly to his superiors in France. In March 1872, he requests “two angels (for) the brackets each side of the Blessed Virgin recess, about 3 1/2 feet. On the pillars in the transept there is room for eight 4 foot statues. The first four beside the sanctuary could be Doctors of the Church; the others could be men or women saints who founded orders, or other popular saints who are easily recognized. “ In an 1873 letter he mentions that, “The statue of Francis Xavier is on its way”. By the 1880s, the external statues can be seen in photographs, in their present positions. The marble altar, which was installed in 1890 and also came from Lyon. It can be seen that the choice of the statues and windows reflected the fact that the Marists were missionaries, coming from a particular background of both Church and State. In particular, the statues may have been simply chosen from the range of M Gousset. Some are of Saints particularly revered by the French, others reflecting devotion to Mary or of missionary service. 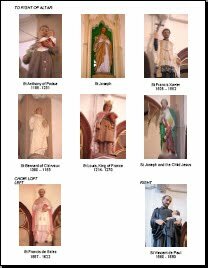 However, eventually there was recognition of the Irish parishioners with the statue and window of St Patrick. Many of these artifacts were funded by donation from wealthy parishioners, including then well known political figures, lawyers and business men. For example, Captain Lewis Truscott and his wife Elizabeth, are commemorated in the windows at the sides of the altar. Captain Truscott was the Captain of the trading ship which supplied the Pacific Island Marist Missions. Interestingly, early photographs show these windows in place , long before Captain Truscott’s death in 1881 and his wife Elizabeth’s in 1907. Close inspection shows that the bottom of each window has been altered to include their memorials. However, the “Ave Maria’ window is both different in style from the others and the memorial to Hannah McBride appears to have been included in its original design. Mrs McBride was the wife of Mr Bernard McBride a prominent lawyer, church activist and major donor to the Marists. The church has 21 windows, two of which are pictorial stained glass. These are in the Sanctuary, directly behind the altar, and were supplied by G. Dufêtre of Lyon, France in 1893. One is of Christ and a holy woman (possibly St. Margaret Mary Alacoque 1647 - 1690) the other depicts the Annunciation. The remaining windows were probably supplied by Lyon Cottier & Co. Sydney. 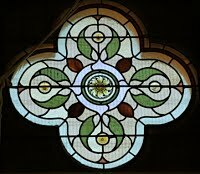 They include two beautiful Wheel Windows in the transepts, two quatrefoil windows on the western walls of the transepts, three plain lead-light windows in the Sacristy and in the porch, nave and transepts of the church there are twelve slightly fancier, attractive lead-light windows.